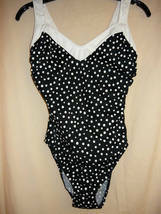 This retro swim bathing suit looks new, but fabric tag is cut out. The front is lined and has a non-padded built in bra with under wire. I bet you would look smashing in the M.M. looking suit. The cup looks pretty full, although the bust measurement is about 30". Waist-24", hip-30", leg hole-20:, length from underarm to leg opening-12". 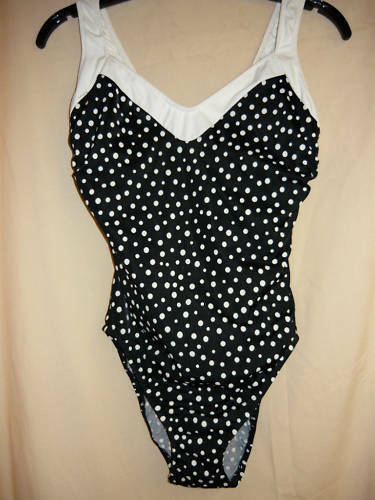 This is a good looking swim suit and looks very comfortable. 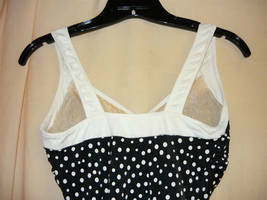 I will be selling off various mixed merchandise from my closed consignment shop. All is in excellent condition unless stated otherwise. I describe items to the best of my ability, so please consider complete listing and MEASUREMENTS to save conflict later. We both want a fair and pleasant transaction now and in the future. Please ask if there is any confusion about the listing and I will do my best to answer in a timely manner. Here's hoping for a long and pleasant relationship with you. Sincerely, Lulu Check out my other items! Please enjoy your shopping experience.